Lucky Zelda: Who Doesn't Like A Freebie? A little enterprise that resulted from people saying, "You should sell your things." I am a theatrical costumer who often gets to work with inspiring fabrics that often end up in a Lucky Zelda item. I am happy to take custom orders. If you see something you like but would like in a different color or fabric, contact me and I will do my best to accomodate you. Due to the inhumane process manufacturing standard silk requires, all of the silk used in Lucky Zelda products is salvaged. No new silk is used. Lucky Zelda is already gearing up for the holiday craft show season. The first one I'd like to share with you is Mary Roseanne's Holiday Shoppe (MRHS). 2011 will be MRHS's second annual show & will take place November 4th & 5th. To start getting the word out about the show, MRHS is having monthly giveaways! 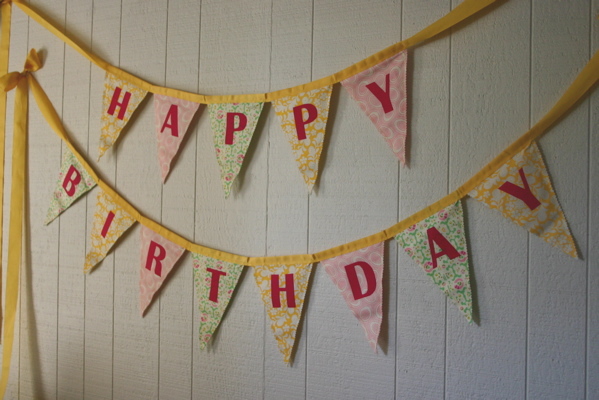 July's giveaway is a beautiful birthday banner made by Lou Lou Creations. Go to MRHS's blog here & read all about the giveaway & the upcoming shoppe. The giveaway is quick & easy to enter so go for it! MRHS is a juried show that has only the best quality hand-made only items. Be sure to mark your calendars. It's a fun, friendly & worthwhile shoppe to get your holiday shopping off on the right foot. Paypal is my prefered method of payment however I do accept Google Checkout payments as well. As of Wednesday, April, 1, 2009 California residents will be charged 8.75% sales tax upon checkout. Lucky Zelda orders are shipped via USPS. I was charged by Etsy & paypal to list & sell the items. with you to get your item to you exactly how you'd like it.